Hometown: South Plainfield, New Jersey, U.S.
Died: June 25, 2007 in Operation Iraqi Freedom. Unit: Army, 425th Brigade Special Troops Battalion, 4th Brigade Combat Team (Airborne), 25th Infantry Division, Fort Richardson, AK. Sgt. Moretti of South Plainfield, N.J., grew up in South Plainfield where she was a track-and-field standout at South Plainfield High School known for her smile. She earned nine varsity letters for field hockey, winter track and spring track and was a member of the 1997 Middlesex County championship field hockey team. She was an exceptional athlete with great agility and speed and exuded enthusiasm and confidence while always giving 110 percent. 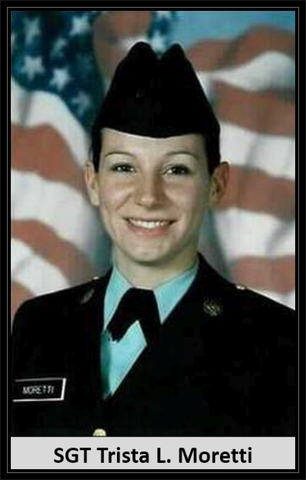 Trista later went onto study at William Paterson University from 1998 to 2000, prior to joining the army. Her army career began with basic training in Charlie Company 3rd Battalion, 10th Infantry at Fort Leonard Wood, Missouri on June 12, 2003. 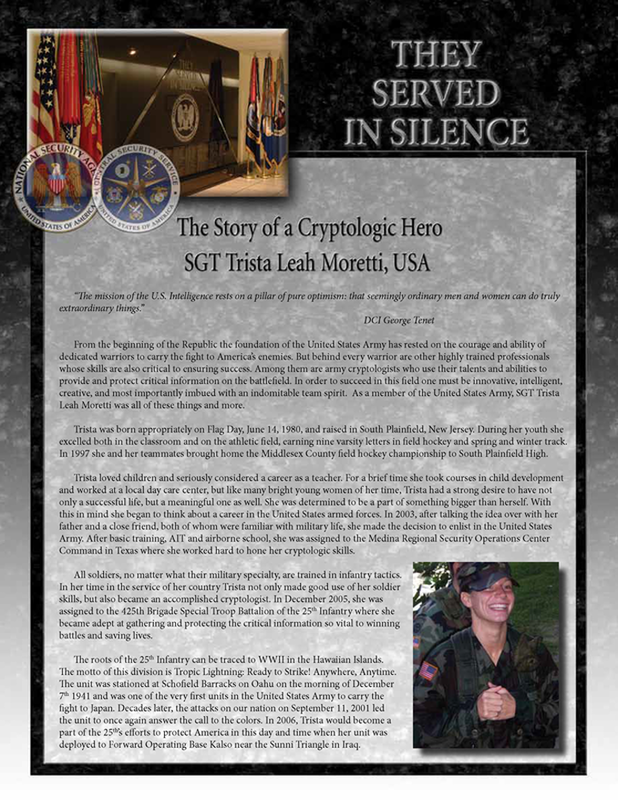 She than attended AIT training at Goodfellow Air Force Base in Texas and proceeded to Fort Benning, Georgia where she completed Airborne Training and received her wings. Trista was stationed in San Antonio, Texas until 2005 when she made the honorable decision to re-enlist and was reassigned to Alaska. After training for approximately one year in Alaska her unit was activated October 2006 and deployed to Iraq. Trista has been courageously serving our country in Iraq since her deployment. She had an unmistakable laugh and her honesty and genuine good nature made you want to be surrounded by her constantly. Trista loved doing new and exciting things. She would try anything once and definitely did not fit the typical "girl" mold. From bungee jumping to sky diving Trista was always looking for an adventure. She had a true appetite for life and let nothing stop her or get in her way of what she wanted to accomplish. She was a patriot who represented all that is good and respectful about America. She died in Nasir Lafitah, Iraq, when her unit was attacked by insurgents using indirect fire at age 27. Fran Flannery, who coached Army Sgt. Trista L. Moretti in field hockey, recalls an athlete always smiling, always laughing. Moretti, 27, of South Plainfield, N.J., was killed by indirect fire June 25 in Nasir Lafitah, Iraq. She was assigned to Fort Richardson, Alaska. “She was fearless,” said her sister, Jennifer Moretti. A 1998 high school graduate, Moretti distinguished herself in athletics by earning nine varsity letters while participating in field hockey, winter track and spring track. She was a member of the high school’s field hockey team that won the 1997 Middlesex County championship. She later went onto study at William Paterson University from 1998 to 2000. She is survived by her parents, Judy and Fred.